The FBI released its latest crime statistics this week, and although absolute levels in the U.S. are still high by international standards, they show that crime of all types was down in 2009. 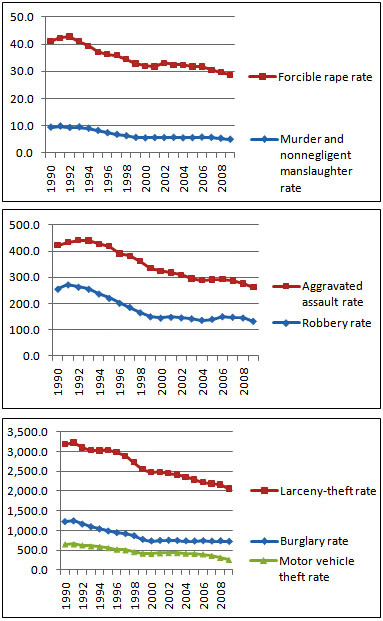 In some cases the numbers were quite significant: murder is down 7% and auto theft is down 17%, for example. Why? Who knows? More policing, maybe. Demographic changes. The continuing effects of unleaded gasoline. Whatever the cause, crime rates have been falling for two decades now, and they’ve been falling everywhere. Not just New York City and not just places with high-profile police chiefs. So here’s your raw data for the day: two decades of uniform crime reporting from the FBI, all shown in rates per 100,000 inhabitants. Just so you know.